Can 10,000 pink bunnies power a smartphone? Phone manufacturers including Huawei and Samsung have already launched foldable phones this month, and now battery manufacturer Energizer is joining the fray. The company launched a slew of new phones at MWC 2019 in Barcelona, including the folding Power Max 8100S. It looks intriguing, although it probably won't pose much competition to the Samsung Galaxy Fold or Huawei Mate X. Which upcoming 5G phones are you excited for? The Energizer Power Max 8100S comes with a dual-lens rear camera consisting of a 48MP main sensor and 12MP secondary snapper, and a 24MP selfie camera. All of the cameras are visible on the same side of the device – the inside tablet screen therefore has no cameras. Energizer's phones are distinct for their massive batteries – the Power Max 8100S launched alongside the Power Max 18K Pop, which has a huge 18,000mAh battery. The foldable doesn't have that much power, but its 10,000mAh pack is still likely to lap both the Samsung Galaxy Fold's 4,380mAh or the Huawei Mate X's 4,500mAh cells. The device is powered by a Qualcomm Snapdragon 855 chipset, and has 8GB RAM as well as 256GB internal memory, which makes it just as powerful as its foldable rivals but with a little less storage. 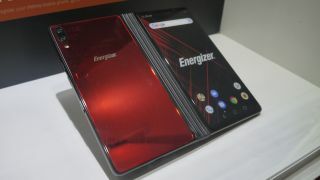 The Energizer Power Max 8100S was unveiled behind a glass case, however, so we couldn't get hands-on with the device. Energizer doesn't always bring its phones to every market either – last year's Power Max 16K Pro was an intriguing solution to solving your battery life woes, but it never arrived in the UK. Curiously we weren't shown a glimpse of the larger foldable screen on the new device – only the main screen and rear of the device were visible. The 6-inch 18:9 main screen had no notch, with the camera sitting inside the top bezel, but the display we saw was likely a sticker (judging by other phones Energizer had on display) so we can't really tell the quality of it, although we're told it's a 8.1-inch 4:3 Full HD foldable display. The device we saw is almost certainly a prototype, and it may be a while before we can get our hands on a working model of the Power Max 8100S.